Forget paper-pulp coffins, human-ash pencils, and "memorial diamonds"— Pia Interlandi's "Garments for the Grave" are how you shuffle off the mortal coil in eco-friendly style. The Australian designer and self-styled "death-wear facilitator" created developed the bespoke label after she struggled to dress her grandfather's body in a suit for burial. Interlandi realized that the clothes we wear in life are ill-designed for death. (The deceased have little use for zippers or buttons, for instance, or even shoes for that matter.) Neither do decomposing need the staying power of synthetic fabrics. Interlandi wanted to create a vesture that, like the body, returned both literally and symbolically to the earth. To create a vesture that, like the body, returns both literally and symbolically to the earth, Interlandi employs natural fibers, including raw silk with embroidery for pieces that go around the collarbone or over the heart, a hemp/silk blend for garment bindings, cotton lace for decorations, a hemp/organic cotton blend for the main shroud, and combed silk cocoons for a final veil covering the body. I am so impressed with this article and this designer. Would love to know more about the textile and how it is engineered. If anyone has any information, please reply and share. "The body is a gift," Interlandi explains in the October 2013 issue Wired. "It's a bag of nutrients and water and protein. When you place it back into the earth, I think the garment is almost like wrapping paper," she adds. Interlandi wanted to create a vesture that, like the body, returns both literally and symbolically to the earth. Interlandi employs natural fibers, including raw silk with embroidery for pieces that go around the collarbone or over the heart, a hemp/silk blend for garment bindings, cotton lace for decorations, a hemp/organic cotton blend for the main shroud, and combed silk cocoons for a final veil covering the body. Interlandi says she incorporates her fashion expertise with elements of funeral celebrancy. 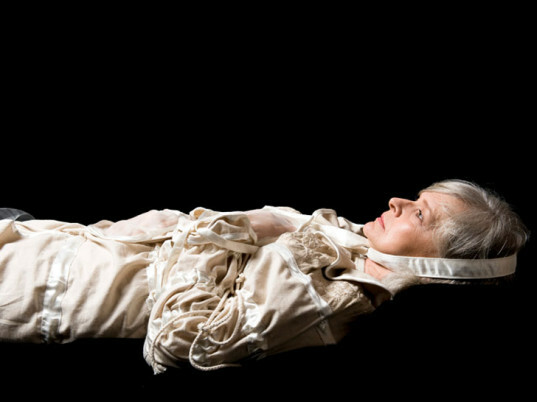 "It is a practice that functions as ritual engaged through the creation or fashioning of a burial garment," she says. "It neither denies nor flirts with death, but presents it in a way that invites observers to view it as natural, undeniable, inevitable and at times, beautiful."